These full color vinyl banners are premium quality banners that will ensure you look your absolute best! Keep in mind you can never make another first impression on your customers. These custom vinyl banners will immediately convey that your company is based on high quality standards. Using the latest large format digital printers with eco-solvent inks, our premium banners are printed at a reduced speed to increase quality at 72 dpi resolution on premium 13 oz. matte banner vinyl. These premium banners certainly grab attention indoors and outdoors. 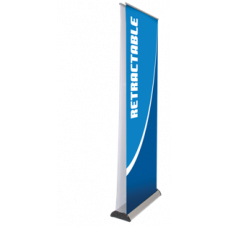 Our premium vinyl banners are ideal for trade shows, banner stands, sales meetings, offices, store fronts, and any event where branding is critical. Whether it's a large format banner or a smaller banner, they will ensure your company's message is prominent and crystal clear. Our premium vinyl banners can be finished with grommets, hemmed edges, reinforced webbing, and pole pockets, depending on how and where you need to hang the banners. If you are unsure of what type of finishing would work best for you, please visit our banner finishing page for more information or contact one our account executives for help. We will ship your premium vinyl banner order in 3 business days from the time we receive your order and final print-ready design files, or proof approval if we are creating the design. Faster turn-around is available if needed, but rush fees may apply. Several shipping options from Ground to Priority Overnight are available to ensure you hit your due date. Contact us if you have any questions. If you are ready to order your premium vinyl banners, please fill out our vinyl banner order form or contact one of our account specialists today! Our discount vinyl banners are ideally suited for clients on a tight project budget where low-costs ..
Our standard vinyl banners are great all around banners that can be used for virtual any application..